The day we left Toronto for Montréal was forecast to be 37°C, and being a Sunshine Coast-local travelling to a country that has no problem dropping below zero, I had packed absolutely nothing that suited the surprising spike in mercury. Luckily, the hottest day fell on the day we were spending most of our time in the car, the AC shielding me and my winter clothes from anything too melt-y. Our visit to Montréal was short, and we hadn’t planned too much in advance — so much so that I was beginning to doubt we’d have somewhere to sleep when we arrived, as my Air BnB searches (admittedly, completed in the car whilst approaching the city) were coming up with no availability and hotels weren’t looking much more promising. Just when it was coming down to our only option touting reviews like “Don’t EVER stay here”, we happened across a decent room in nice enough hotel and we could relax into our stay. Our hotel was a short walk from the subway station, and it was a novelty to suddenly be immersed in French, navigating our trip and trying to figure out what the train driver might be yelling at the passengers with bikes. 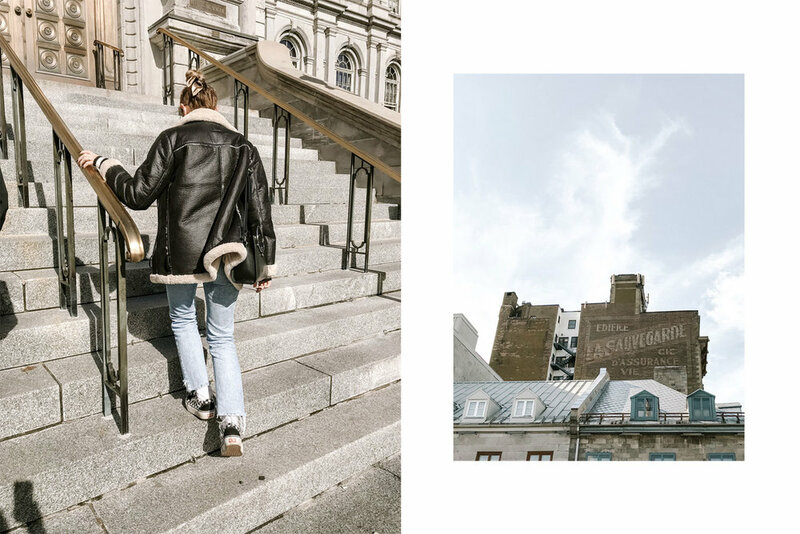 We caught the subway to Old Montreal and wandered the streets, heads constantly turned up at the amazing architecture, some of which, as Wikipedia is telling me, date back to the 17th century and make up one of the oldest urban areas in North America. The contrast of being in Toronto then suddenly in Montréal was really crazy; from modern city to cobblestone laneways and ornate chapels. 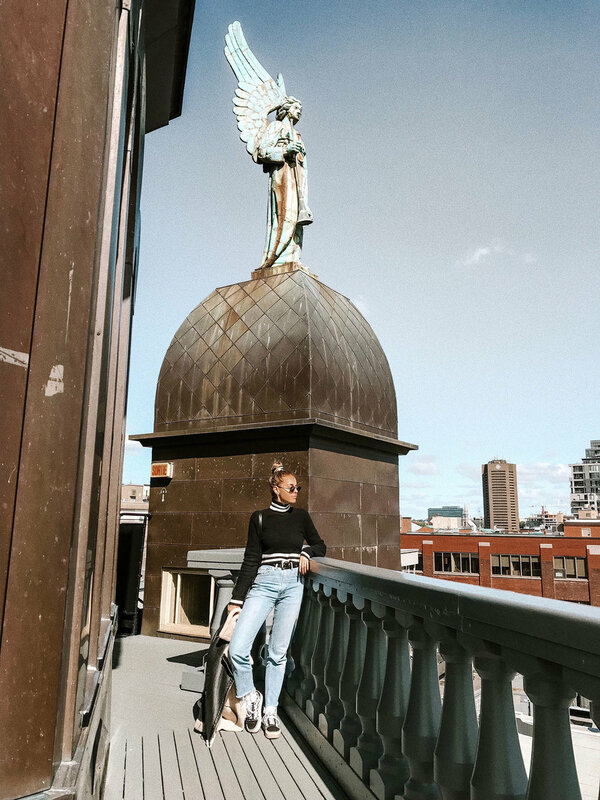 We spent most of the day exploring the Old Montreal area, walking around the port and visiting the Notre-Dame-de-Bon-Secours Chapel, where you can climb to the top of the Chapel’s tower and see the city from above. We also happened to catch the 2018 World Press Photo Content, previous years of which I had visited in Brisbane and knew it’d be worth the ticket. It’s an incredibly profound collection of images and a worthwhile experience, every year. Due to a marathon that day, some of the buses weren’t running, so we decided to walk our way around the rest of the city instead. It’s always so worth it, you notice so much more on your feet. We stopped for lunch at a very very tiny and completely satisfying burger shop called Patati Patata, and seeing as I’m addicted to fried potato, I loved it. You can sit at the window and collect your beer from the counter without leaving your seat. If you can find some space, it’s your dream poutine stop. We only had one full day in Montreal, but I loved the day we had. The city is an activity in itself, it’s nice to be able to wander the streets and not have to really spend any money to see something interesting. It really was like a little European holiday in the middle of our American one!